Tide Rising Art Projects is an artist-led initiative coming out of Kingston, Jamaica. The initiative is the brainchild of Jamaican artist and lecturer, Oneika Russell. We started out of an identified need for actively practicing local and regional visual artists to have their practices documented and promoted. Oneika’s involvement with the Caribbean Linked IV programme in Aruba, her work with NLS Kingston and the 5 year period spent teaching students of various levels and disciplines at The Edna Manley College of the Visual & Performing Arts all inspired the creation of the project. We started recording our first videos in March of 2017. Our aim is to document and promote the practices of local and regional contemporary artists and initiate engagement opportunities for Caribbean contemporary artists within the region and internationally as well. We also aim to provide education opportunities for artists and the public as well as research resources through our videos, website content, seminars and workshops. Our current projects in 2019 involve the creation and publishing of online videos about local artists as well as ongoing collaborations to promote a curated group of contemporary artists in the Caribbean. At present our resources dictate the scale of project we can work on but we do view these early projects as the necessary capacity building activities for an eventually larger reach. Oneika has been a practicing artist both locally and internationally from 2005. 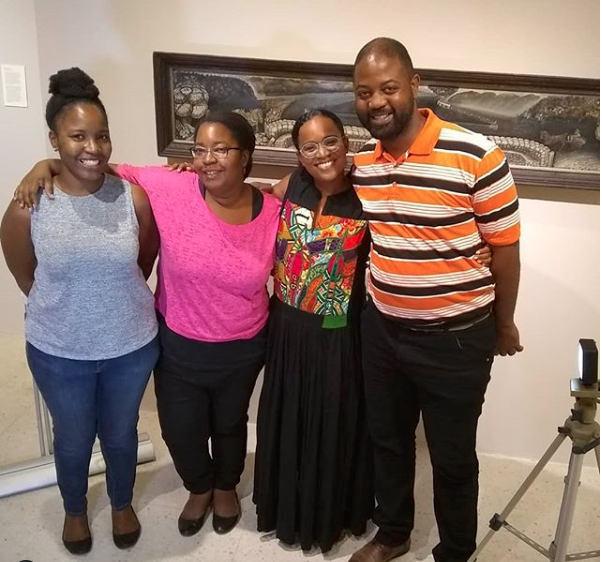 She has exhibited both regionally and internationally and has had the opportunity to participate in various programmes such as the MEXT: Monbukagakusho scholarship, the Davidoff Art Initiative/ Residency Unlimited Residency Programme and the Commonwealth Arts & Crafts Award. She has also taught at The Edna Manley College of the Visual & Performing Arts in Kingston from 2014-18. Oneika was also the creator and main contributor behind the crucial and now archived art blog, ART:Jamaica. Oneika acts as producer, secondary videographer and editor on the series of short form art docs on our YouTube channel and liaison/ planner for our curatorial projects. Danielle Russell is a local filmmaker who has participated in both The British Council’s script development workshop and the JAMPRO/JAFTA PROPELLA script to screen development film project. Both projects have seen the short film she developed through the programme be screened at The Trinidad & Tobago Film Festival. She has also acted as art director and producer on other local films. She studied Communication at CARIMAC at The University of the West Indies in Kingston and Film and television at The Communication University of China in Beijing. She has also taught ‘Storytelling’ and ‘Scriptwriting’ in the University of Technology, Jamaica’s Animation BSc. programme. Danielle works as videographer and advisor for our art videos on our YouTube channel. Petrina Dacres is the Acting Head of Art History at The Edna Manley College of the Visual and Performing Art. Her teaching and research centers on Caribbean and African Diaspora Art, Public sculpture and memorials, and memory studies. She has also worked as a curator, most recently on the exhibition, ‘Uprising’ at the National Museum Jamaica in 2016. And, was recently the inaugural Stuart Hall fellow at Harvard University's Hutchins Center. Petrina has been working with the initiative as an independent curator on two projects currently in process.